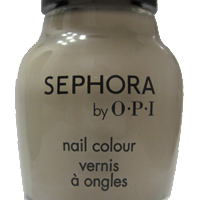 This particular shade doesn't work for me for two reasons: 1) it's a creme, and it tends to want to be a bit streaky; and 2) it's just a little bit too yellow for me. It makes my fingers look more red (the infamous “lobster-hands” effect.) I got it for half price when it was on clearance at Sephora, and I may be able to use this as a stamping polish. It will contrast nicely with dark browns and deeper, blood reds. You can see the thinner spots in the enlarged photos. I wasn't all that thrilled with the color or the consistency on this one, not for full manicures. I'll just have to hope that it won't be too thin to use for nail stamping.